In the third in our series of blog posts on open education around the world Ben Taylor has written about open education in Tanzania and primarily a new initiative called Shule.info which uses open education data. Ben Taylor (or Mtega as he is known in Tanzania) is an Open Development Consultant with Twaweza. Twaweza means “we can make it happen” in Swahili and is a ten year citizen-centered initiative, focusing on large-scale change in East Africa. Prior to working for Twaweza Ben was the founder-director of Daraja, an innovative NGO working in rural Tanzania on governance and accountability. He also worked for WaterAid for three years and SPW (now Restless Development) for six, all in Tanzania. More recently, he was (briefly) part of the Aid Info team at Development Initiatives. Ben has an MA in International Development from the University of Manchester, UK, and a BA in Mathematics from Oxford University. Ben collects his thoughts on his blog Mtega. In Tanzania, secondary school exams are a hot political topic right now. A rapid expansion in access to both primary and secondary schools has been followed by a dramatic drop in pass rates. The aftershocks from a particularly bad set of results earlier this year continues to rumble on, with apparently superficial changes being brought in while root causes go unchallenged. But the overall decline in pass rates hides some huge inequalities. Some schools – those in urban areas, those with wealthier parents – continue to do relatively well, while it becomes harder and harder for even the brightest children from poorer areas to succeed in life through education. Into this context comes shule.info, a fascinating new website that presents Tanzanian Form 4 exam results in some very interesting ways – Shule means school in Swahili. It is potentially very useful to anyone with an interest in education in Tanzania – students, parents, teachers, local government, politicians, journalists and analysts. Showing how performance (by region) has declined over time, while the number of students has risen. Would you like to know how well your secondary school (or your child’s school) is performing? Would you like to compare exam results across different regions of Tanzania, to follow trends over time, or to see the effect of the adjustments made to 2012 exam results? If so, this site is for you. Launched (in beta) earlier this week, it has been put together by a group of young Tanzanian software developers, led by Arnold Minde, with some support from Twaweza. Detailed data for individual schools. 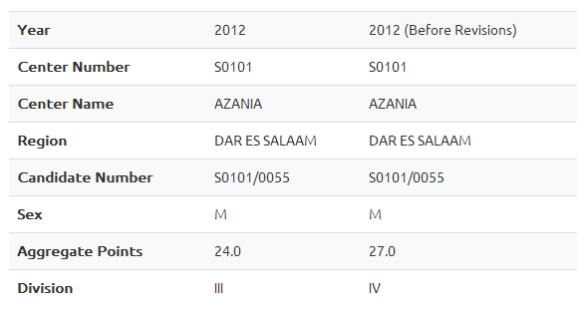 The site uses data that the Tanzanian government has, for several years now, been publishing on Form Four exam results. This started long before the current fashion for open government and open data, and well before Tanzania signed up to the Open Government Partnership (OGP). It wasn’t published particularly as an “open data” initiative, but simply as a way for individual students to access their results. Arnold and his team therefore had to do a lot of work downloading and processing the data to make it usable, even before they started finding interesting ways of presenting the data. Summary of results by student – anonymised so you can get results if you have a student’s registration number, but without giving names. I find the site very interesting for a number of reasons, that go well beyond the contents. First, it was developed by young Tanzanian developers on their own initiative – they came to Twaweza rather than Twaweza going looking for them. And they came primarily for advice, rather than for funding. Second, by coincidence, shule.info has been launched not long after the National Examinations Council of Tanzania (NECTA) released it’s own Education Dashboard, presenting much the same data in some very different ways, under the heading of the Big Results Now initiative. And the Open Institute in Kenya has also been working on something similar – Find My School .Ke. Some might call that duplication, I call it healthy competition. The most useful site will attract the most users. Third, even though shule.info uses data that wasn’t released under an “open” heading, it shows clearly what is possible when government datasets are made public. It’s a real-life example of the “let a thousand flowers bloom” theory of open data. Publish, publish, then publish some more, said Tim Berners-Lee, and someone you don’t know will find unexpected and interesting things to do with the data. It doesn’t always work, but in this case it has. Arnold is an infomediary – an ugly word, but a useful one – meaning someone who can turn the raw materials of data into something useful to “ordinary” wananchi. There’s a supply, there’s a demand (we assume), and now there’s something in between. I hope Shule.info gets the traffic it deserves.